Found that while walking around town with a friend. I don't think there's much of them remaining. Not young, too. I have never seen one of those. That also qualifies as Best Of. Location? 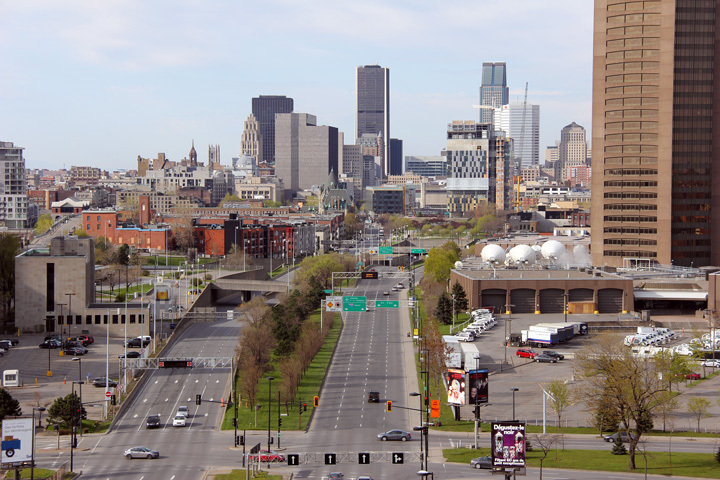 Rue Charlevoix and Rue Mullins, in Pointe-Saint-Charles neighborhood. Dates back from the toll era, probably early 70's, but can be younger because seems unaltered by the sun, even though the sign faces northwest. 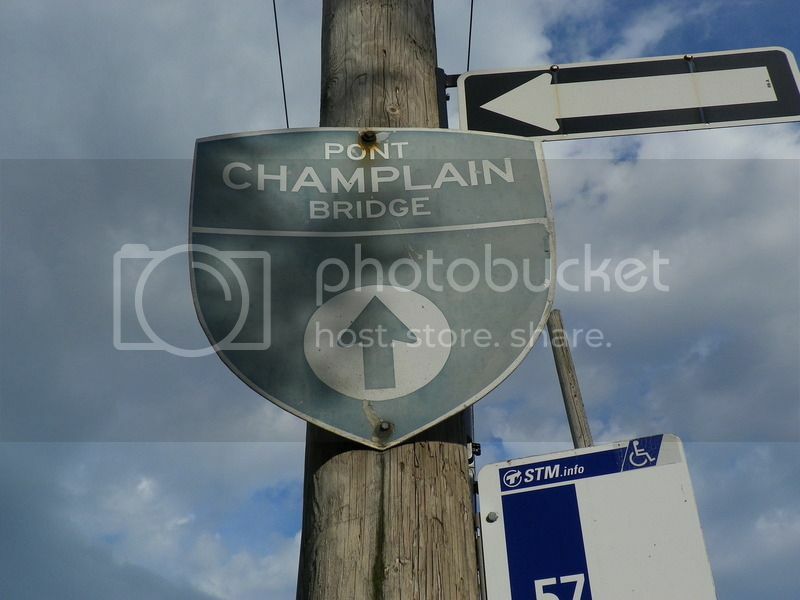 The preceding trailblazer (located at Charlevoix/Grand-Trunk) is a plain «A-15 sud» sign, the following (Charlevoix/Knox) is a «[ahead] Pont Champlain» MGS. I don't think it is unaltered. I believe the original color was much closer to blue. but that is just conjecture. Canada Freezes Before Your Roads. Definitely a great find, webfil! you'll notice that there's a stub ramp on the right and a bulldozer chewing into the ramp on the left. 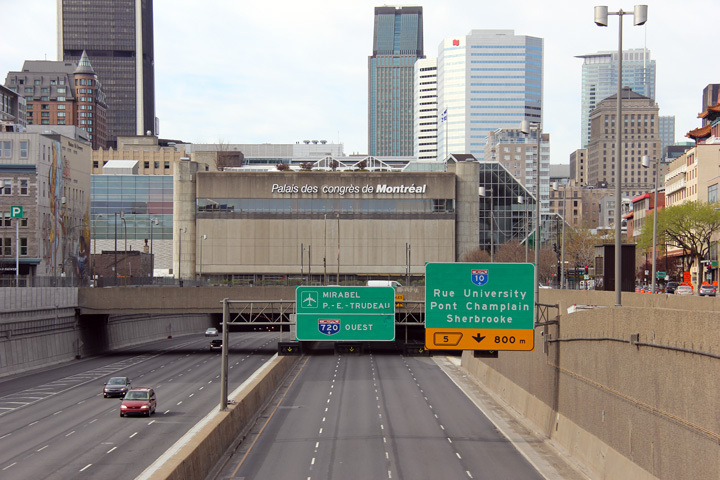 I'm trying to find out what those ramp stubs were for - were they the original ramps to head south on QC 175, or were they stubs for something else? A historical map or aerial image from the 1970s or 1980s would be perfect, or just your own knowledge. Wikipedia refers to "removal of stubs," but that could just as easily be the mainline stub. 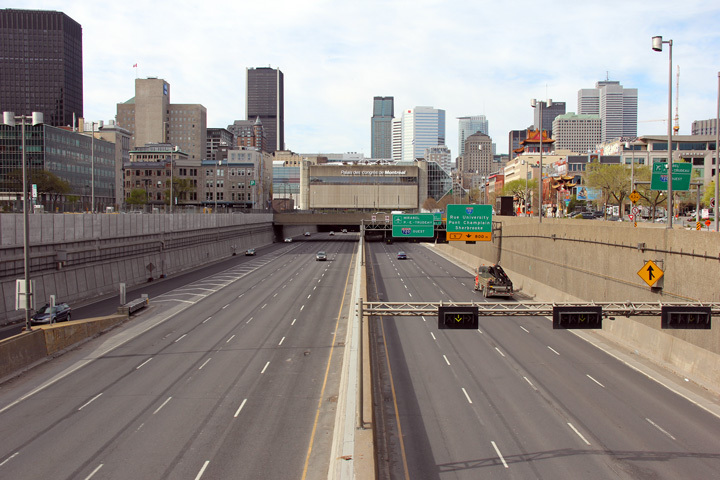 I recall reading on another site, maybe Steve Andersons, Roads of Montreal, that those ramps were to serve a tunneled highway route underneath the surface route served by the ramps that are to remain, something about a tunnel route to underneath that would ultimately provide access to the estern shore of the island. 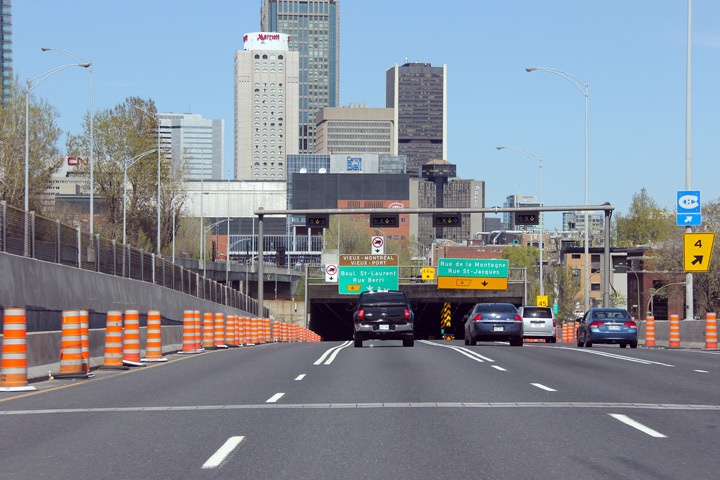 That stub in question was for a once planned tunnel to link Dufferin-Momontrency autoroute (A-440) with Champlain blvd. This thread was worth it for that link alone. Stéphane Dumas pointed out cool pictures on another website. They are night shots of A-40 and A-73 in Charlesbourg (Québec City). 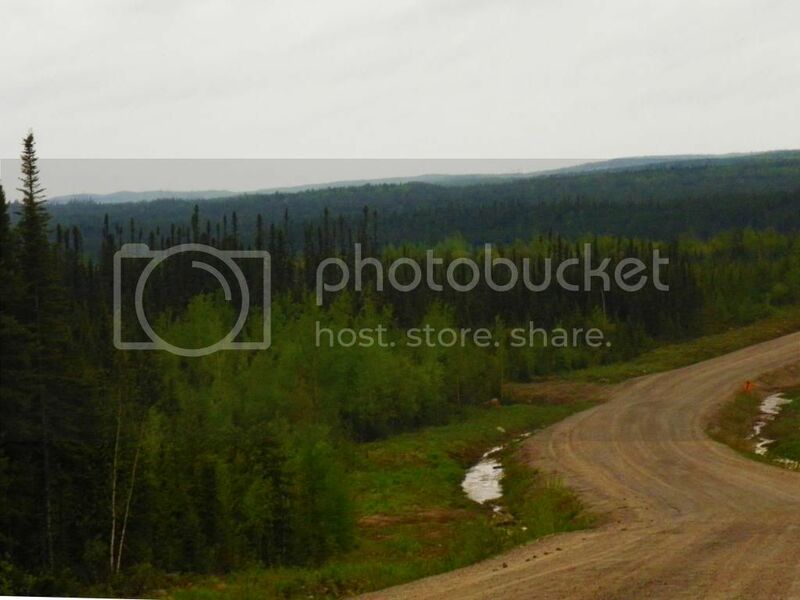 Here are a few photos from logging road 0212, between R-167 (the junction is located @ kilometre 85 of route 167) and Opitciwan Atikamekw community. The road is co-maintained by Ministère des Ressources naturelles and logging companies, as it gives access to an isolated community ― logging roads are usually maintained by the companies only. They go through impressive clearcuts, which are not visible from highways (can't see/can't hurt...). 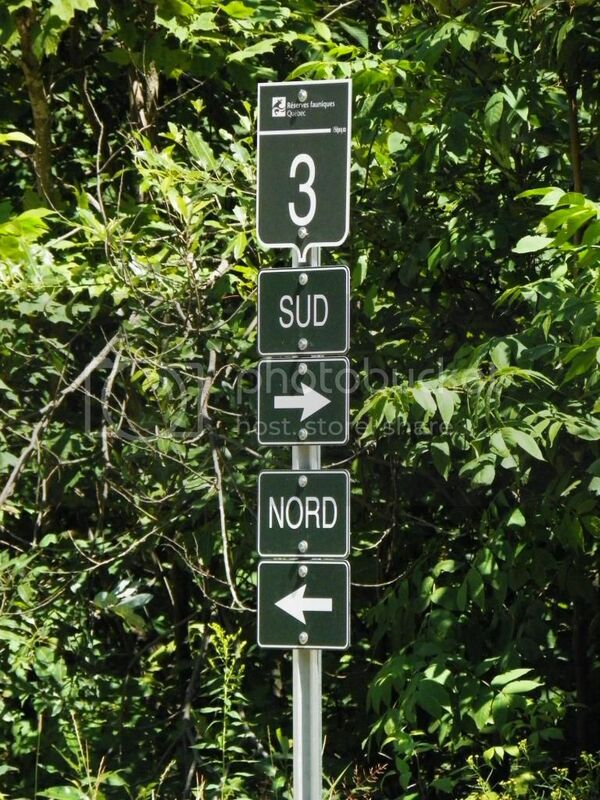 Warning signage found along these roads is rudimentary, although directionnal MGSs can be found at major intersections, pointing either towards Opitciwan or Saint-Félicien. Since the road is not subject to provincial standards, important warnings (keep left, announce your position, CB channel 9, etc.) 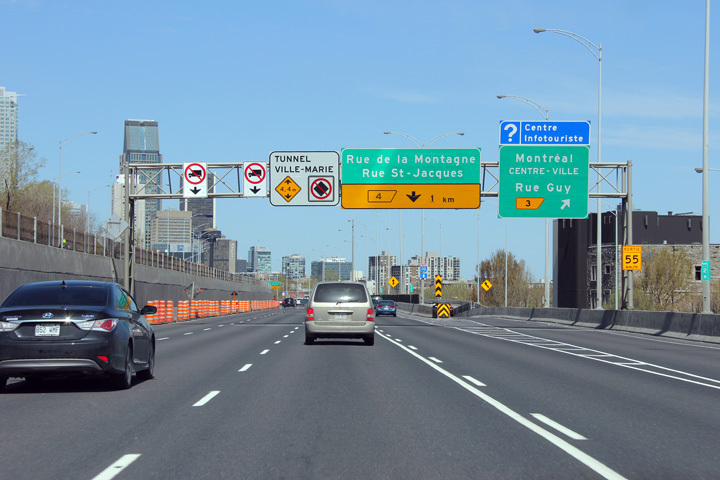 are notified to drivers with white-on-blue text signs, as opposed to ideogrammatical signage usually found in the province. Speed limit is 60 km/h between km 0 and 104, then 70 km/h up to km 161. 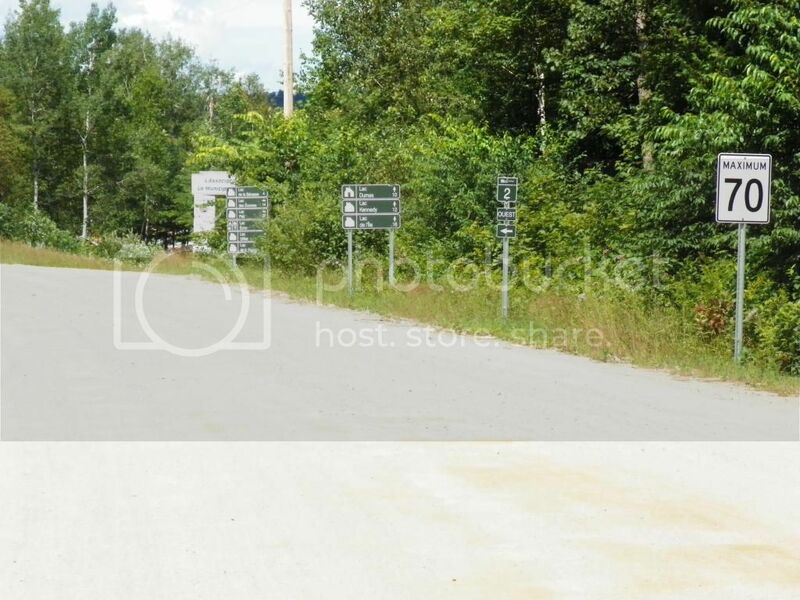 It drops to 50 km/h approaching the core of the community and then to 30 km/h in the village (i cannot find my "Maximum 30 Petokemari" bilingual sign photo). 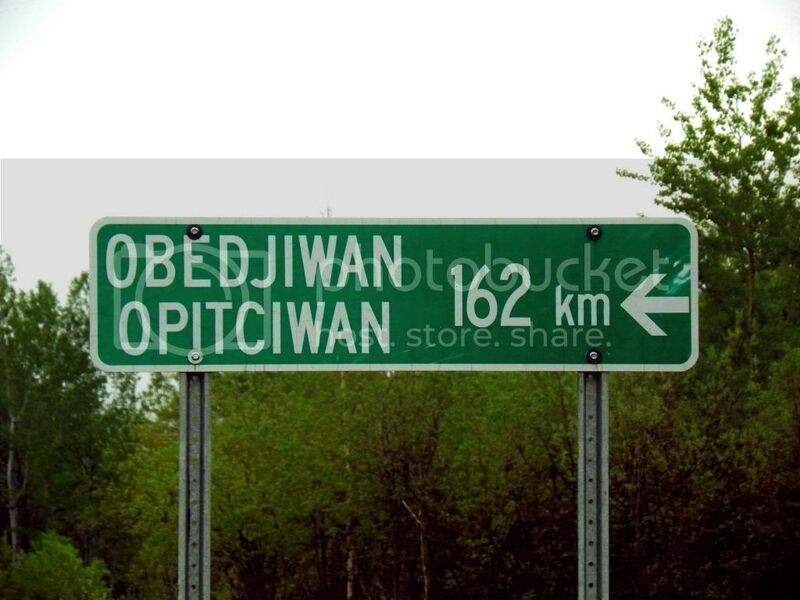 Interesting tidbit : stop signs in Opitciwan are unilingual french, which is usually not the case in most Aboriginal communities in Québec where bilingual, nay trilingual signs are found. If you plan on travelling logging roads in Québec, let me advise to always carry proper UHF radiocommunication equipment. 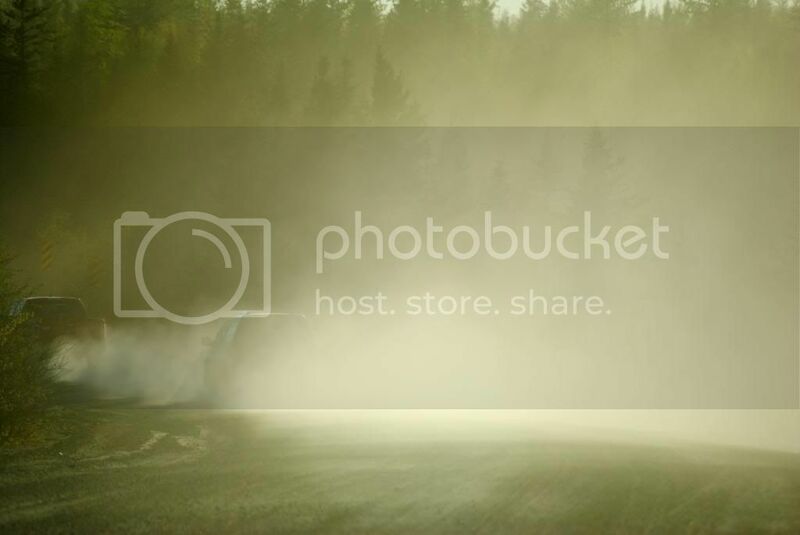 Not announcing your position on logging roads, even at daytime, is putting your life in danger, with the risk of facing a truck unaware of your existence. There is little to no traffic on these roads and no wireless network nor emergency phone is available, so planning such communication equipment is a strict minimum. Please excuse the poor quality of some shots. Vibrations due to road condition and rain made photography quite hard. I decided to share anyways, I think this is of some interest. French-Atikamekw bilingual sign. Pronounce /o.bit.ˈtʃu.wɑn/ or /o.bɛd.ˈdʒi.wɑn/. Yeah, like this. 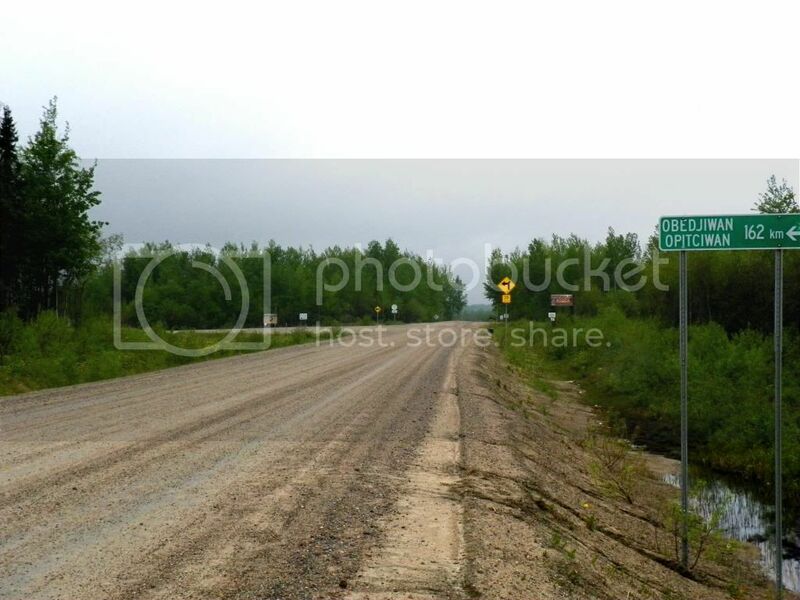 Junction 0212 and 0203 @ kilometre 4, near Abitibi-Bowater logging camp. Note the complete absence of shields, even though some Wikipedia articles make usage of such a shield ― never saw that. 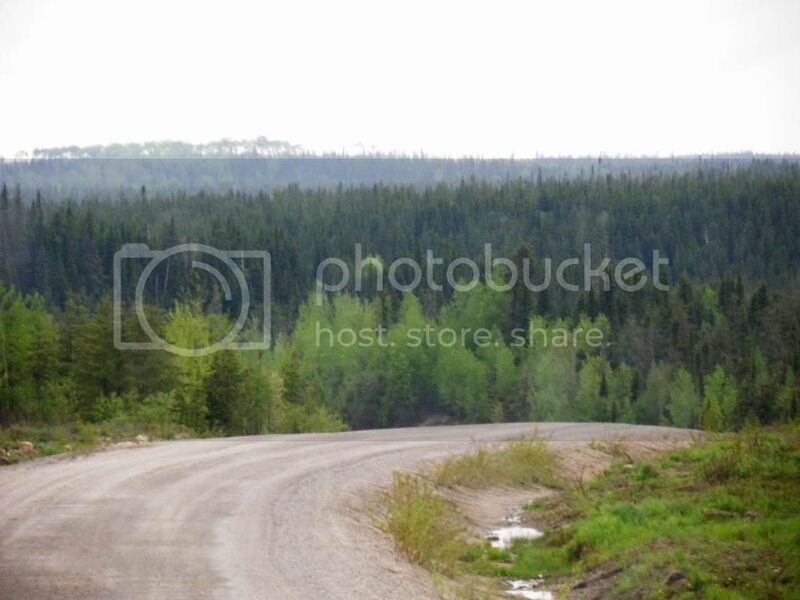 Nonetheless, I saw some 2-digits provincial-route-alike green shields bearing numbers I can't match with any maps, past or present ; I know logging road numbering is quite changing, and are solely for adminstrative purpose, for the account of either the Ministère or logging companies. Do not expect to see these. Looking east @ kilometre 4. Looking west @ approx. kilometre 34. Nice descending curve. Looking west @ approx. kilometre 35. One of eight 1-lane bridge along 0212. This one is located @ approx. kilometre 50, over unnamed river. 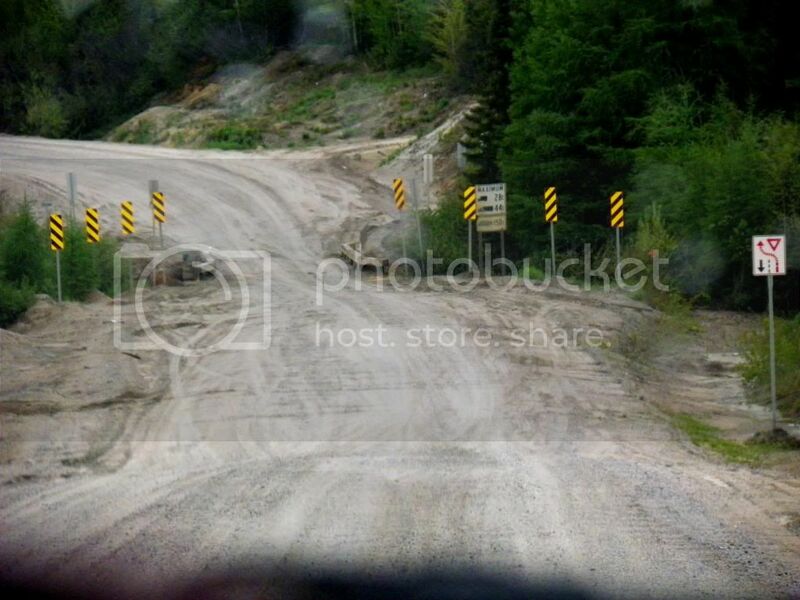 Drivers are required to announce their position at least 1 kilometre before crossing bridges. The sign you see right-hand is standard for "Yield to Oncoming Traffic" in Québec. Traces of human settlement. Junction 0212 and 1046 @ kilometre 92. From here in a 4-kilometre radius, 0212 dips into Hudson Bay watershed and Baie-James municipality. 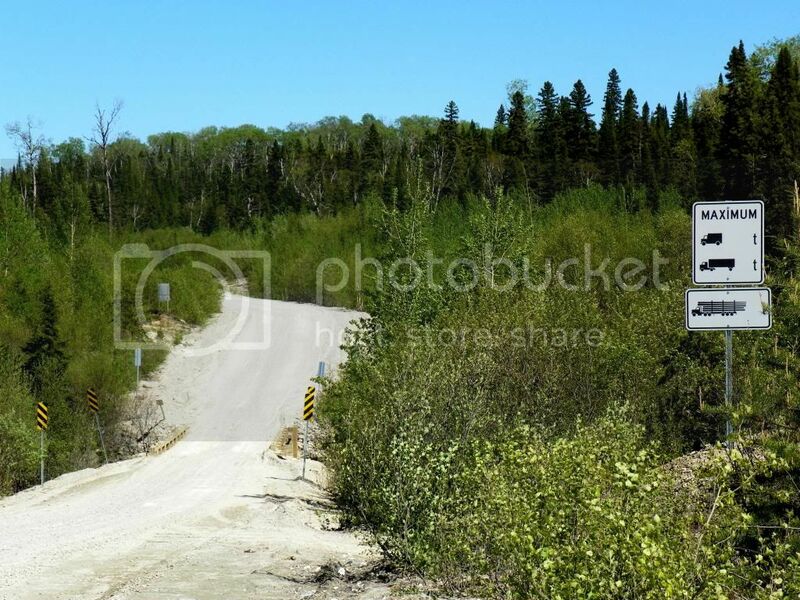 The remainder is located in unorganized territory or in city of La Tuque, on Saint-Laurent watershed. 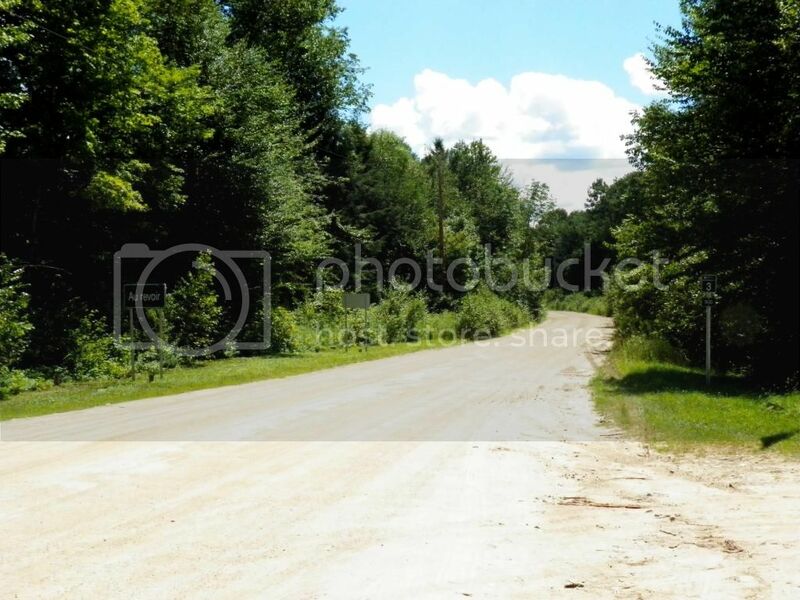 Dirt road. 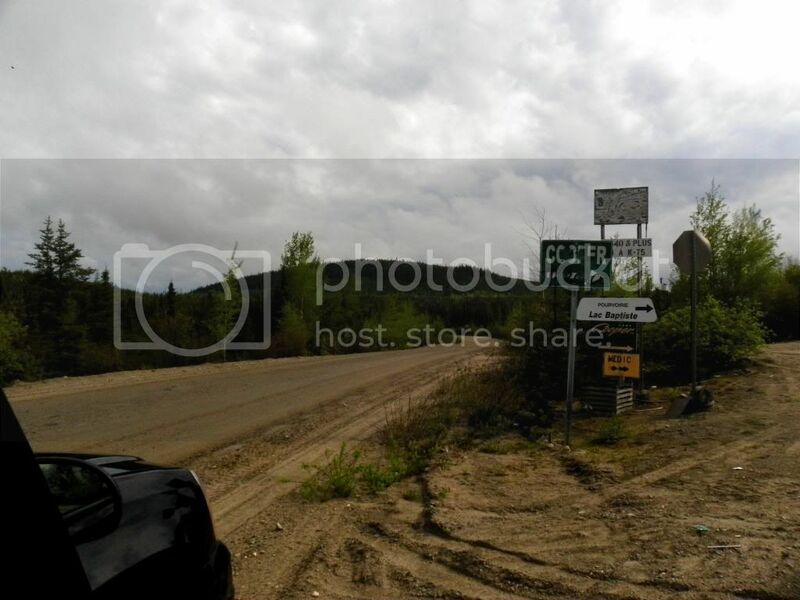 Route 0212, approaching Ruisseau Mathieu @ approx. kilometre 147. No limits. Route 1046 over Seskatciwan Sipi (Toussaint River), 6.5 kilometres north of Opitciwan. 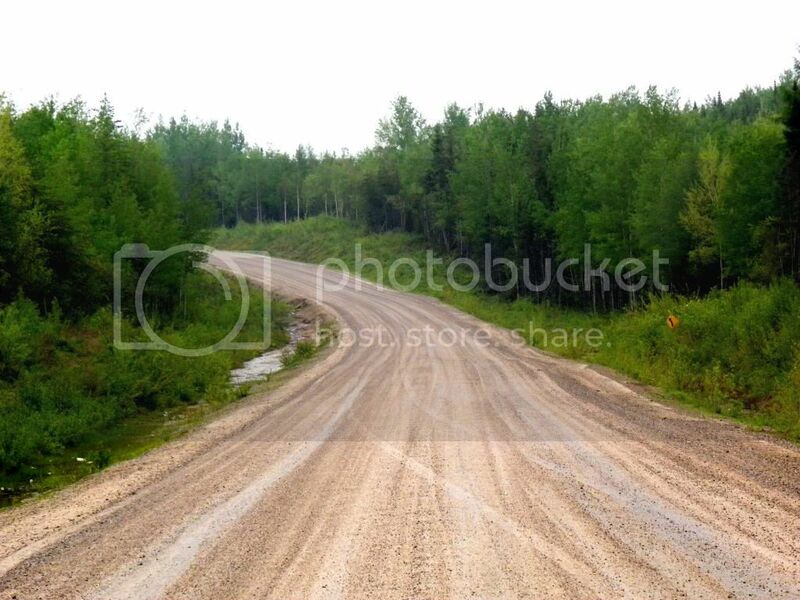 Some rough backroad I enjoyed driving in traditional Atikamekw homeland. That's awesome. Thanks for uploading the photos! I have some photos of R shields, as well as Reserves Fauniques Quebec shields, which are a darker shade of green than the provincials. 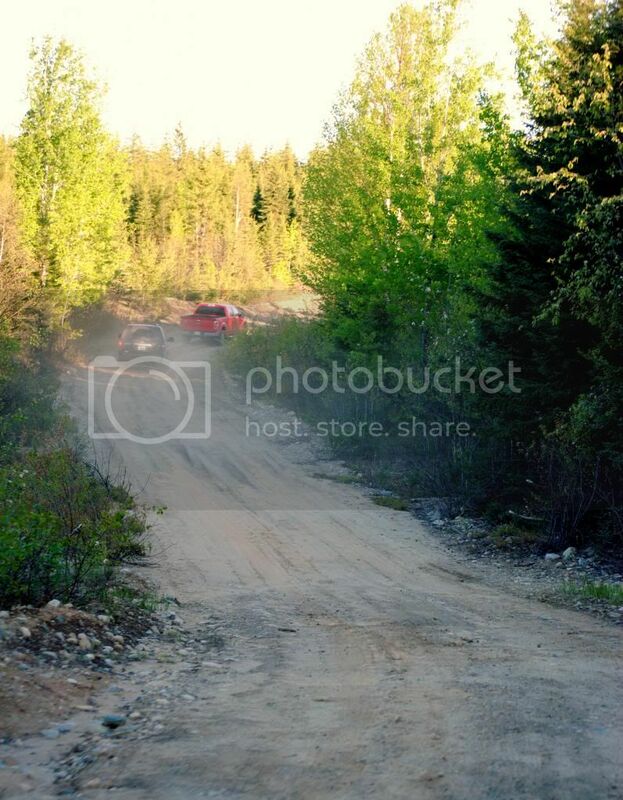 they were all taken on roads leading up to the James Bay Road. 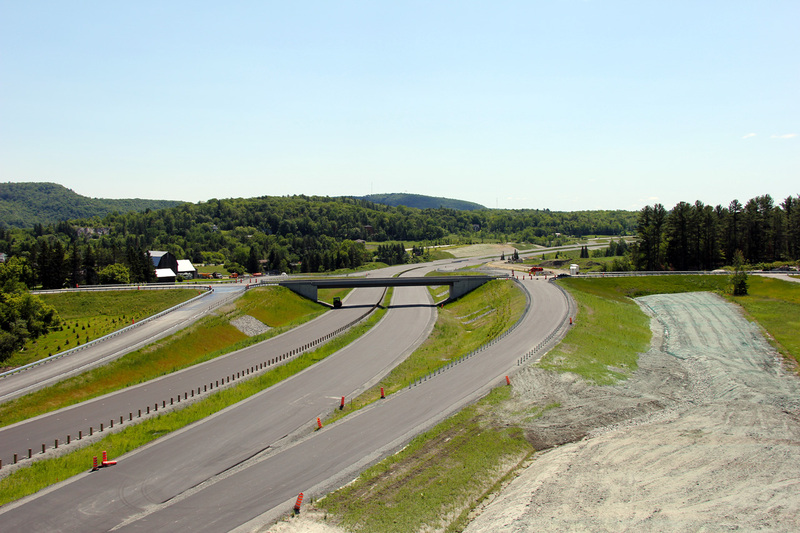 \any pics or news on the Rte-138 extension to connect the huge gape to Newfoundland and Labrador? Thanks. Atikamekw people is awesome too, but that awesomeness is sadly harder to record via photography. I'd be willing to see that. I know SÉPAQ (the provincial authority responsible for parks, wildlife reserves and tourist resorts) has a brown, provincial-route-alike shield of its own, from which I saw examples in Papineau-Labelle reserve and Mont-Tremblant park. any pics or news on the Rte-138 extension to connect the huge gape to Newfoundland and Labrador? Bridge has still not been built yet. I would not be surprised if Chevery, Aylmer Sound, Tête-à-la-Baleine and Mutton Bay/La Tabatière/Red Bay would be the first communities to be linked together. Chevery has an all-season airport with an asphalt runaway and facilities, which is not the case for the other mentionned settlements. Topic about R-138 end, with pictures of "winter" R-138, Route Blanche. Do you have a map of your travels? We first planned to go there via Parent (via R-117 and R-311, 675 km) and were offered to be guided from Manawan (via R-131, 584 km). I'm looking forward to return to Opitciwan and use one of these two options. I am deducting this is the Farm Point interchange. Any updates on the Wakefield bypass extension towards Alcove? I know it is scheduled to open in 2 or 3 years; has the construction began yet? EDIT : Construction workers' general strike might have affected ongoing construction, thus giving the impression of stagnation. Nothing starting north of Wakefield that I could see, unless there was some advanced clearing or something. I stopped my trek north at Hwy 366, as I wanted to spend some time at Hwy 417 in Arnprior. I had wondered why there was no construction ongoing when I visited the site on a Wednesday. The grève would explain that. Here is one example of that said Réserve faunique (wildlife reserve) dark green shield. It was shot at the junction of Papineau-Labelle routes 2 and 3, north of Montpellier, QC. All of the dark green signs (shields and lodge trailblazers) were not there last year. Route 3 is a trunk route in the reserve. We've also been on route 2, although I was not in position to take any picture. As we had to stop to register the catches of the day at the gamekeeper's booth, I took the opportunity to take out my camera. 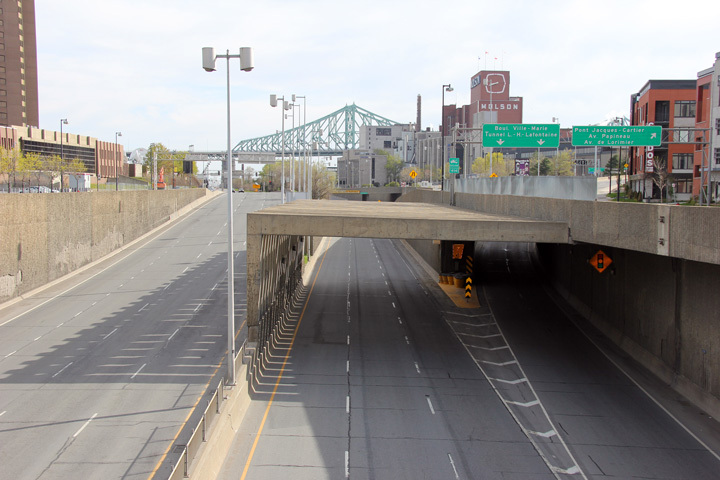 Here is a shot of route 3 looking north at "Accueil Mulet" (Mulet Gate). The location is here, which is a mere 50 kilometres north of A-50. 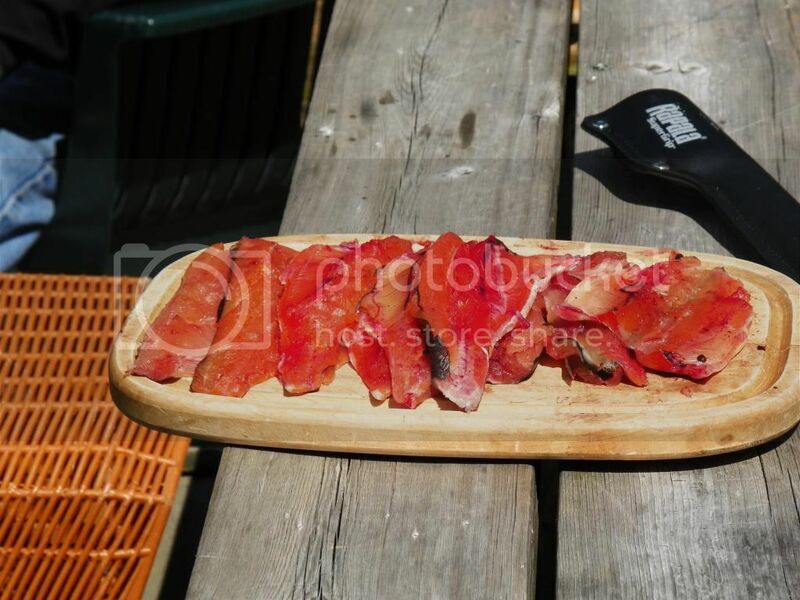 Here is half of yesterday's catches before being smoked with maple embers. Freewaybrent made a nice video of A-73 in Quebec.